I really wish that I had taken a photo of my laundry room before I fixed it up. The only thing in there that was pretty and not outdated, was the new floors we installed. 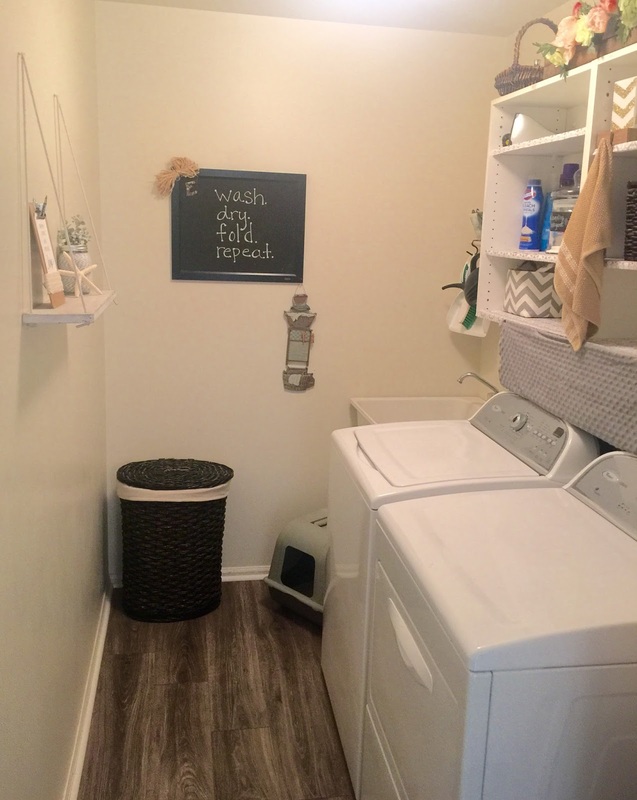 There is so much more that I want to do in the future with my laundry room, but it's probably not going to happen for awhile. I wasn't going to let that stop me from making it look a little nicer and it shouldn't discourage you either. I do a lot of laundry, so why not make the space a little more pleasing to be in. Plus our's is connected to our kitchen and visible to others when they come to visit. 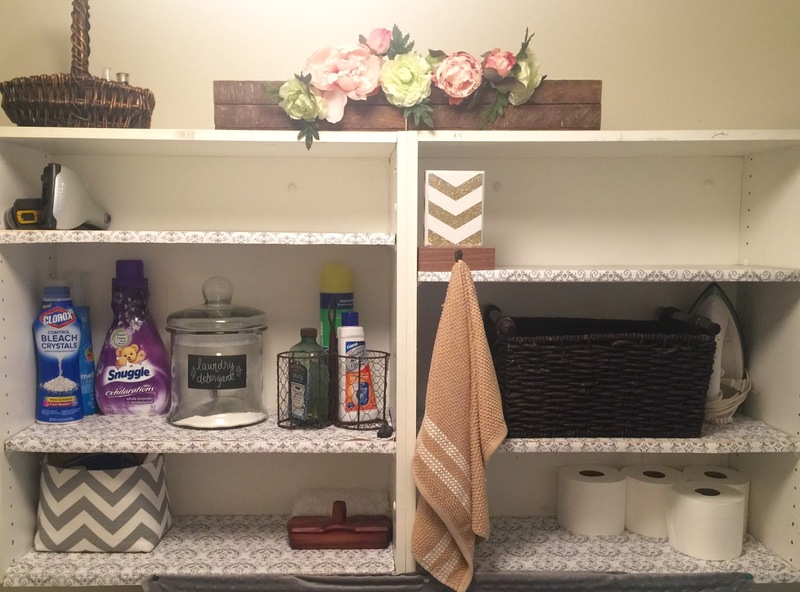 Here are five easy things you can do to upgrade your laundry room space. 1. Take the doors off of your cabinets!! It's so simple. I know sometimes it can be scary to have your shelves exposed, but it looks so nice when decorated and organized properly! You may not have cabinets in your laundry room, maybe you just have a shelf above your washer and dryer, and that's even better. No removing doors for you! 2. Baskets!! Baskets are the best for organizing your stuff and they look nice. Maybe you were a little skeptical about exposing what was in your cabinets, because they weren't organized. This is the perfect opportunity to clean everything out and organize all your stuff. You can use big baskets (or pretty storage boxes) for all your detergent, fabric softener, etc., and small basket for miscellaneous items. I keep toilet paper and paper towels in there too. 3. Add wall art/pictures and a few pretty extras. I added a chalkboard to my one wall and hand lettered a cute saying on it. I also hung a floating shelf with a cute picture and flower vase, and put some fake flowers on top of my shelving unit. 4. Hide all the ugly stuff! But seriously, try to move it out of view! Nobody wants to see all your mops, brooms, and other random things just sitting out. I have a space between the one wall and my dryer where I store my portable vacuum, ironing board, and extra paper bags. I also hide a bucket out of site with my broom and dusters. 5. Buy a nice laundry basket! This one is so easy! There are so many different options out there for cute laundry storage. 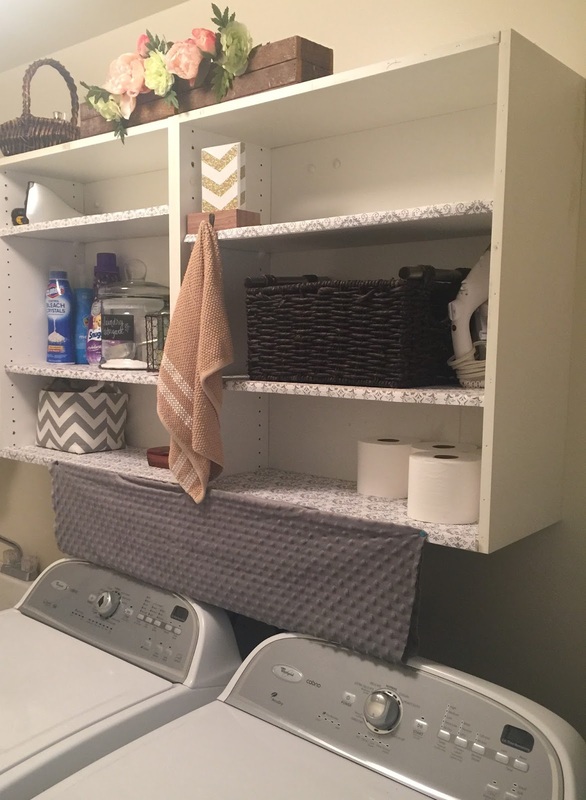 Now for those of you who do not have any type of cabinets or shelves in your laundry room here are two other options for you >> Option 1: hang a shelf and Option 2: measure and lay some ply board overtop. 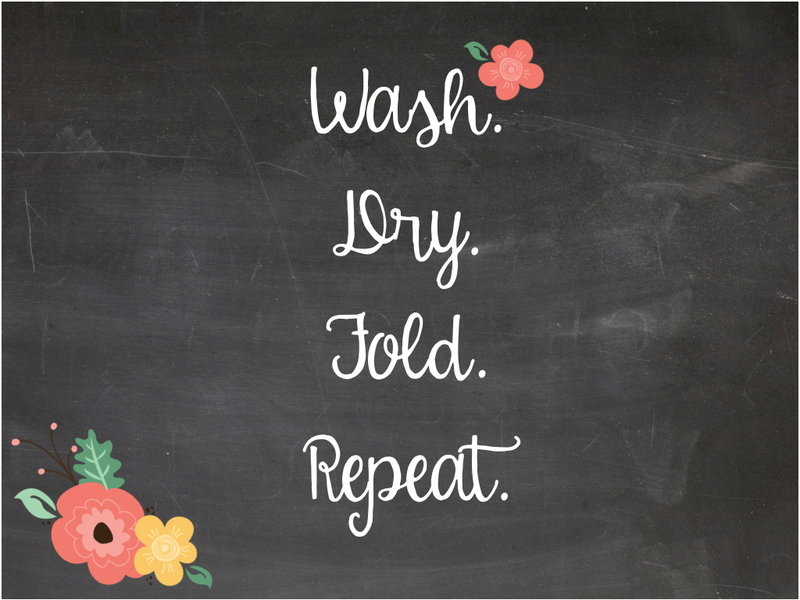 I have created this >> cute art print for you to print out and hang in your laundry room. There are a ton of free prints on Pinterest too!! Hopefully after you fix up your laundry room the way you like it, doing laundry will be a little more enjoyable for you!